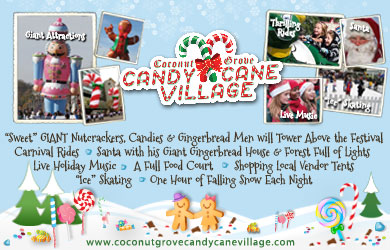 Bring your sweetest winter wonderland dreams to life with a visit to the Coconut Grove Candy Cane Village! Spend just $40 for four admissions to the village (an $80 value), where you'll be delighted by a larger-than-life holiday candy land! Visit with Santa in his giant gingerbread house, gain unlimited access to 15 thrilling carnival rides and be dazzled by a Peppermint Forest packed with bright-shining lights. Take a break with a live musical performance featuring talented carolers, interactive activity tent and even experience the magic of snow fall in Florida! Throughout the holiday season, Coconut Grove will be "candy-coated" in festive decorations, and the "cherry on top" will be the brand new Candy Cane Village! This 3-day festival will take place from December 21st-December 23rd, the weekend just before Christmas. The Coconut Grove Candy Cane Village is the perfect winter treat for family and friends, a sugary sweet sensation that you won't want to miss! May buy multiple vouchers. May buy multiple as gifts. Each voucher includes 4 admissions. Each voucher is for single day admission on any one of the following dates: December 21st, 22nd,23rd.